The Greg Carvel era is reshaping the hockey landscape in western Massachusetts. His image snaps in the wind outside the sporting fortress known as the Mullins Center. Every conceivable hockey goal has been reached in his three-year tenure, and there is clearly more to come as the Hockey East regular season champions advance to Boston Garden and beyond. Although Carvel brought both St. Lawrence and UMass to their respective conference semifinals in three years, the similarities end there. Carvel is currently driving a juggernaut at UMass, a superpower that is the top-ranked team in Eastern hockey, having dropped but a single game at home. This from a program that suffered 29 losses just two seasons ago. He was clearly enjoying himself at his last home game press conference of the year. Surrounded by friends and family, he teased his tireless sports information director, pumped the tires of freshman goaltender Filip Lindberg and continued his theme of gratitude, especially towards his sophomore superstar Cale Makar. Although Makar will never admit it, Carvel knows that he will only get one NCAA run with his phenom. The two men have combined to propel this program to dizzying heights in two seasons together. Next stop—Boston Garden for the Hockey East Championships, a venue UMass has not been to in 12 years; then on to the NCAA regionals for the second time in program history. 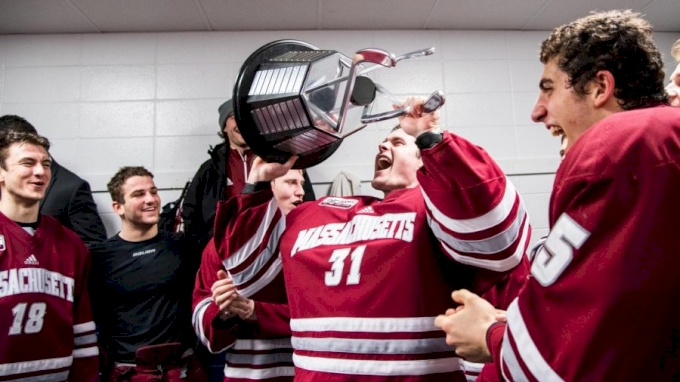 Should the Minutemen reach Frozen Four in Buffalo, something no UMass team has ever accomplished, UMass athletic director Ryan Bamford should consider putting up a flag outside the Mullins Center with the image of Makar, right next to Carvel’s.